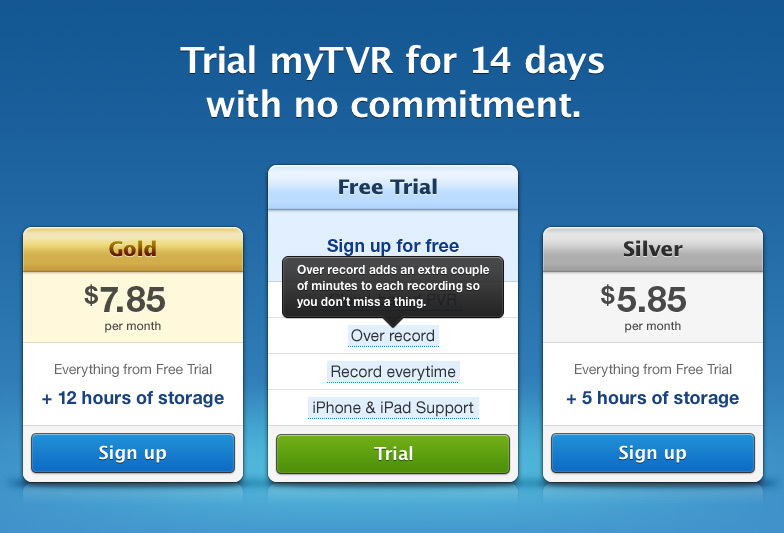 Long before TV channels had their own catch-up product, myTVR allowed you to record live television and watch it back on your desktop or mobile device. I was responsible for all of the design work, which ranged from desktop and mobile sites, to newspaper advertisements. 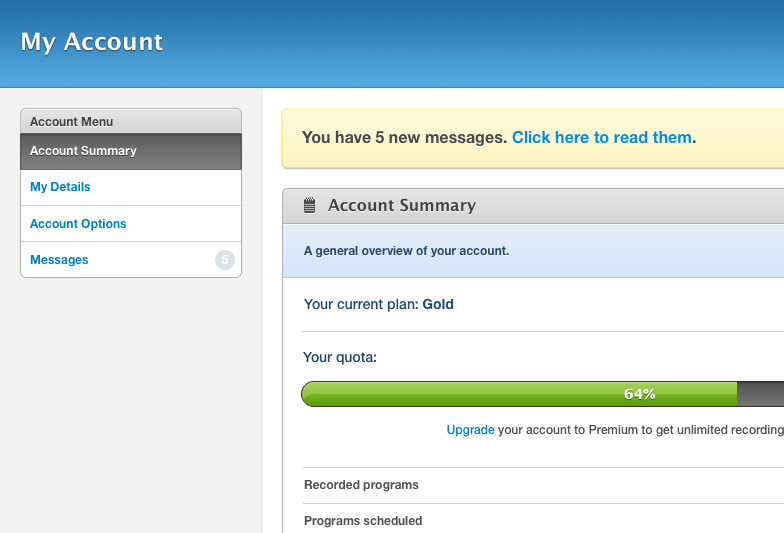 The sign up page offers a clear comparison of plans. More information is available when hovering over or tapping the highlighted text. Managing account settings via the Account page. 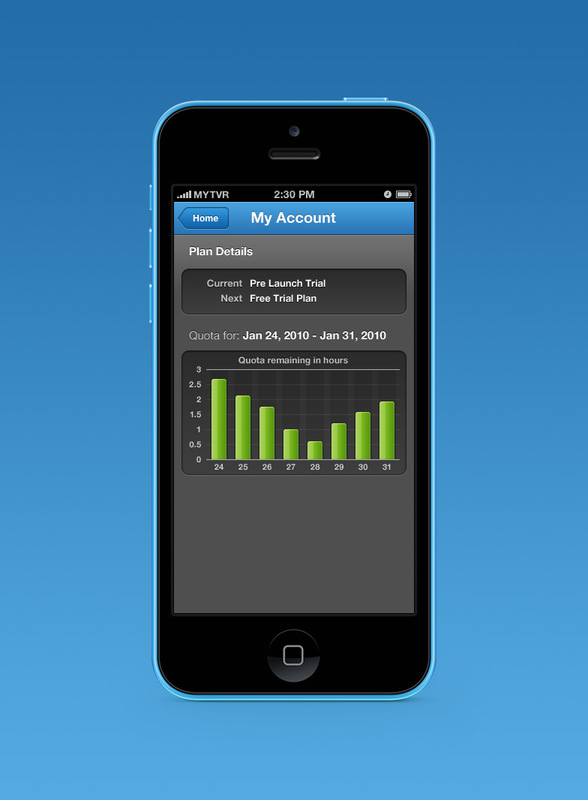 Plan and quota information is available at a glance. 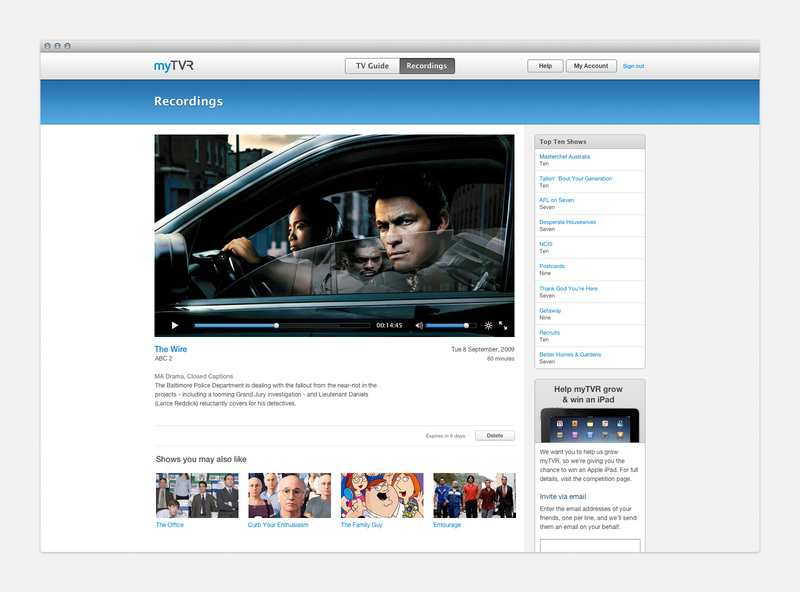 Given the whole point of myTVR is to watch TV, it was crucial to get the playback page right. Everything was designed around a large video window that could be displayed in full screen. A sidebar to the right provided information such as top ten charts and current promotions, while more relevant items, such as program information and related shows were displayed directly underneath the video. 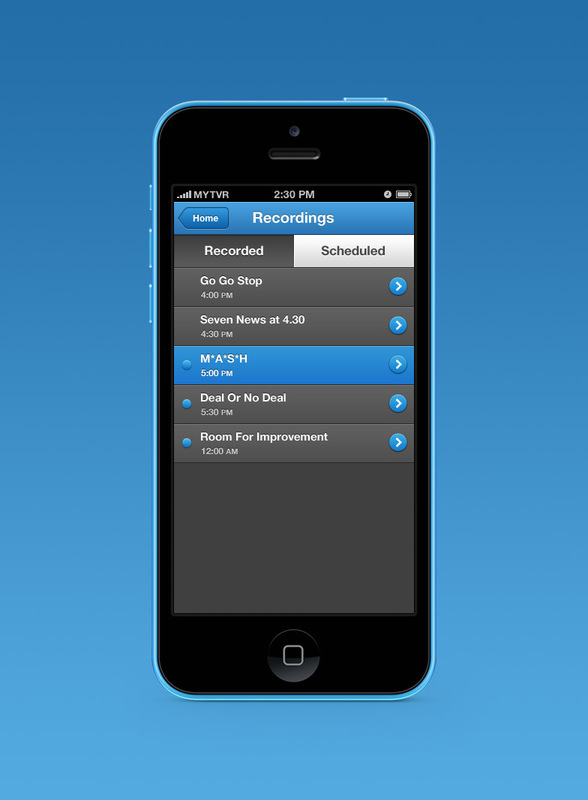 Users could schedule recordings up to seven days in advance, making for hours and hours of television. Designing a user-friendly experience for navigating through such a large amount of information was paramount. Inspiration was taken from calendar applications, being able to quickly jump between dates and times. There are also colour-coded time blocks for selected items, scheduled items and recorded items. myTVR included a feature to record shows that recurred daily or weekly, meaning you never missed the latest episode of your favourite show. Many online services force users to sign up before actually using the product. 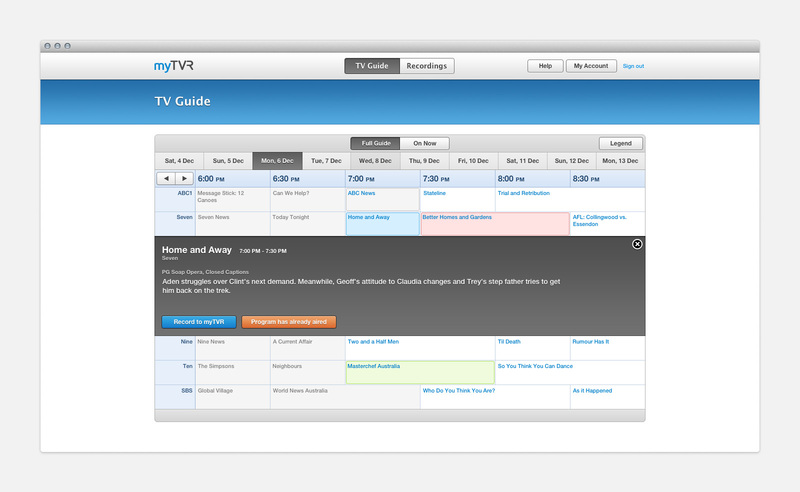 myTVR allowed anyone to browse the TV guide and watch a short sample recording, quickly familiarising them with the concept. Only when trying to record a show were people prompted to register an account. Being able to watch TV while catching the train home was one of the major selling points for myTVR, and was the focus of a newspaper advertising campaign. Therefore, it was important to get people watching as quickly as possible: a ‘Record & Play Now’ feature meant users could watch live TV with only a very short delay. The TV Guide was re-designed to work best on smaller mobile screens and if your train was running late, you could always schedule that episode of Home & Away you’re missing and watch it at home later!